Hello, again! I hope that you've decided to join me for the Autumn in August feature here on A Well-Seasoned Life. I've been busy trying to find recipes that are rich with fall flavors. For this recipe, I jazzed up a recipe for raspberry-filled thumbprints and put a fall twist on it by adding apple pie spice and apple jam. On a recent trip to the mountains of North Carolina, we stopped by a produce stand in Hiawassee, Georgia and I got a jar of apple jam. It is filled with nice chunks of sweet apples and was perfect for this recipe. Apple jelly from the grocery store would work just as well. In a large bowl, cream the butter, sugar and vanilla until smooth. Add the flour and apple pie spice. Mix until well incorporated. The mixture will be thick and crumbly. Use your hands to press the mixture into a flat disk, cover with plastic wrap and refrigerate until chilled, about an hour. When ready to bake, preheat oven to 350 degrees. 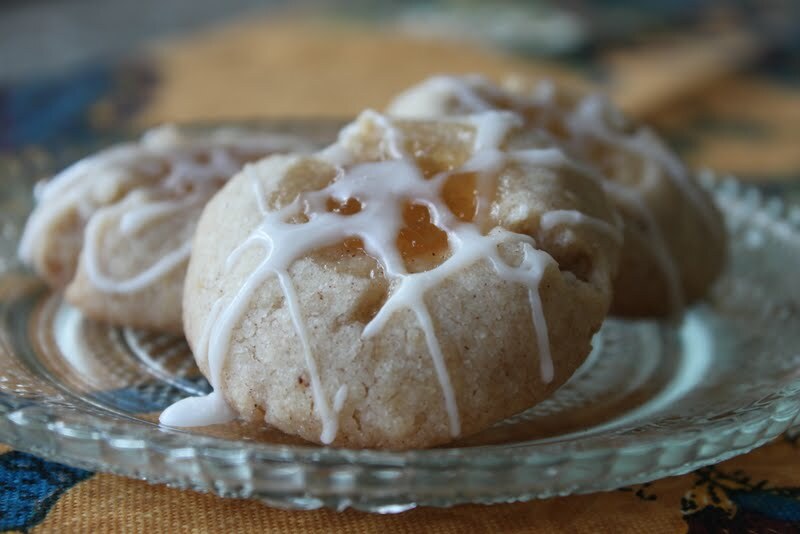 Form the dough into one-inch balls and place on a parchment paper-lined cookie sheet. Using the back of a measuring spoon or your thumb, press an indentation into the dough. Fill with apple jam. Bake for approximately 15 minutes or until lightly browned. Cool completely. 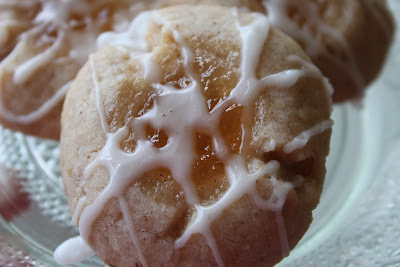 Mix up the glaze and drizzle over the cooled cookies. Makes approximately 24 cookies. 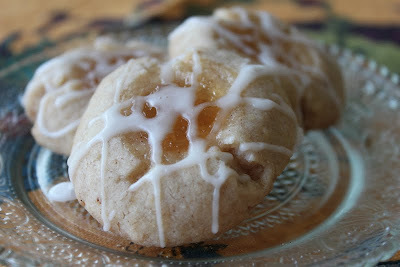 ﻿This cookie represents my favor fall flavor combo - apples and cinnamon. I hope you'll try them when you want to bring a little autumn into your life.